Mumbai: Doctors from Sir HN Reliance Foundation Hospital and Research Centre (HNRF) has performed the first robotic kidney transplant surgery on a man suffering from renal failure. The team of medicos was led by Head of Urology and Robotics Dr Inderbir Gill, who is also Professor and Chair, USC Institute of Urology at the University of Southern California. This is the first surgery in Maharashtra. Leena, 55, the wife of patient C.N. Murlidharan, donated one of her kidneys to enable him to live a normal life. 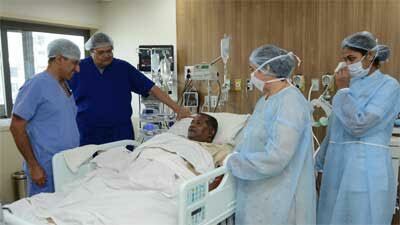 Murlidharan, 59, received a kidney donated by his wife Neena on July 2. “The family agreed to opt for the surgery over conventional method after we told them that it has greater precision over vascular anatomy owing to higher magnification and finer scaled movements of robotic instruments,” said Dr Inderbir Gill, head of department, urology and robotics. “Moreover, it enables greater precision over vascular anastomosis owing to higher magnification and finer scaled movements of the robotic instruments,” he added. The da Vinci robot was used through keyhole incisions to anastomose the graft kidney vessels to the patient’s blood vessels using microvascular instruments and sutures. The 360-degree movement of the robotic arms, suturing with fine tremor-free movements of the robotic instruments, helps in precise anastomosis and since the incision is not over the site of the graft kidney, infection chances are negligible and recovery is much faster, doctors said. Murlidharan said the robotic surgery was not very painful either. “I was initially reluctant but the doctors convinced me about the benefits. I am happy that I went ahead with it,” he said. After the first successful robotic transplant surgery in Maharashtra, both the patient and the donor are doing well, said Gill.